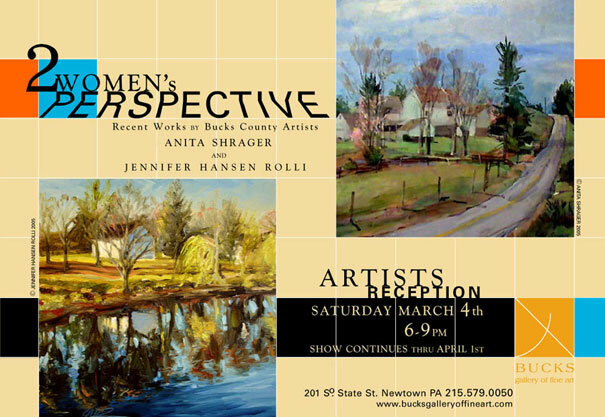 The Bucks Gallery of Fine Art presents"Two Women's Perspective" featuring the works of contemporary impressionist painters Anita Shrager and Jennifer Hansen Rolli. Opening reception will take place on March 4th 6pm to 9pm. The show will run through April 1st. From beautifully depicted images of Cutalossa Road in the winter to Prallsville Mill in the spring, Anita Shrager possesses a timeless style and an innate ability to bring Bucks County's familiar places to life on her colorful canvases. Shrager has studied and painted with some of the most renowned artists in the country including T.M. Nicholas, Kevin McPherson Will Barnet and Irby Brown. She is a recipient of the "Award for Traditional Oil painting of the Delaware Valley" at the Phillips Mill 76th Annual Fall Exhibition and has also received the Windsor Newton Gold Medal for excellence in oil painting. Today, living in the wonderful community of New Hope she draws inspiration from the river towns of New Jersey and Pennsylvania painting in the style of the New Hope Impressionists. Jennifer Hansen Rolli, inspired by her native surroundings and unforgettable childhood memories has created an undeniably important career as unique as her works. She paints as an expression of her outlook on life, finding joy in the small things, painting the light, capturing a moment in time. Jennifer Hansen Rolli is a dream fulfilled say gallery director, Joan Groody. "I am one of the few people who has seen a majority of Hanxen's paintings as they have passed through my handsand into the hands of collectors. Jennifer is a caliber painter and a truly exceptional person".